Thai eating customs don't share many similarities with the American customs, in most respects the eating style is quite different. To start with one similarity, Thais use a fork and spoon to eat (contrary to what you might expect, chopsticks are not the main utensil). However you may see only one spoon being used, in particular the short Thai stainless spoon which is found all over the country to eat everything from soup to fried rice. 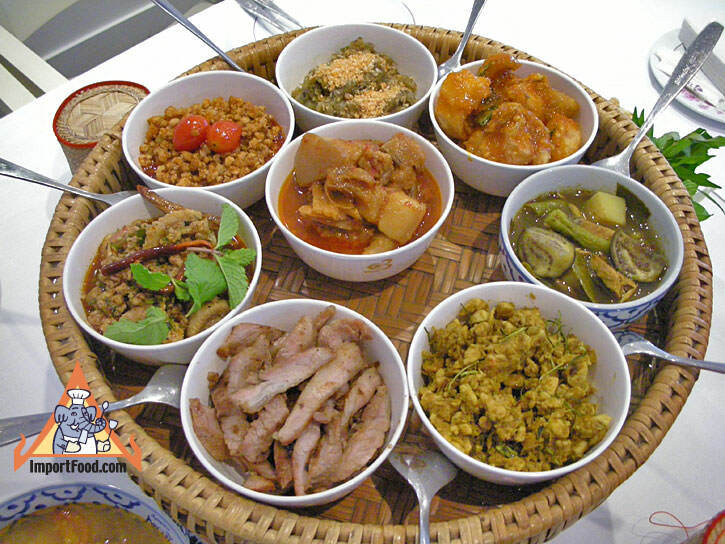 In a Thai meal, various dishes are placed on the table for people to share--you wouldn't eat one thing exclusively. Below is a fairly common gathering. Each person starts with a plate of rice, and in the middle of the table are different things to eat. Ideally, as in the picture, the meal to be shared includes a bowl of soup, at least one spicy dish, a plate of fresh vegetables, and various sauces for each person to add flavor based on preference. Here there are three difference sauces in the middle (in small bowls). Nearest is namprik kapi (with the yellow spoon). 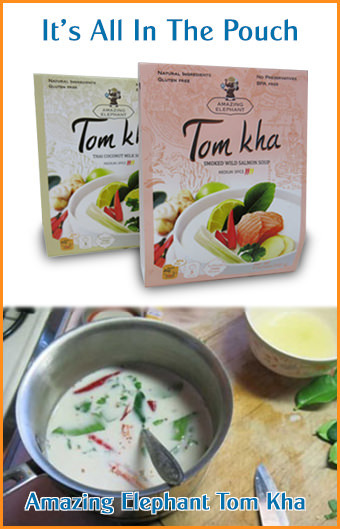 To the left of namprik kapi is nampla prik, which is a mixture of fish sauce, chopped Thai chile peppers, and a touch of lime juice. To the right (on the fish plate) is namprik tadaeng. 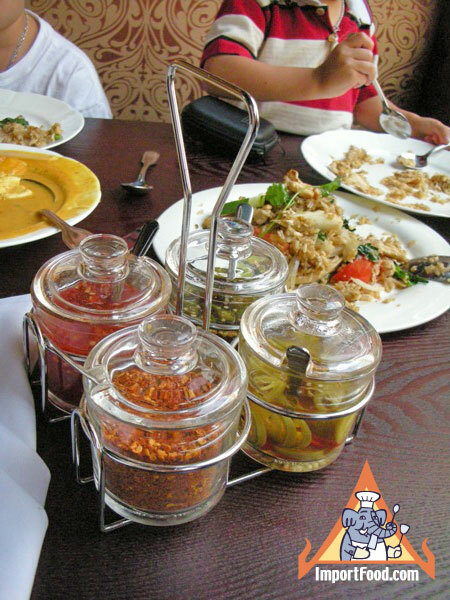 While American Thai restaurants usually don't bring the typical Thai table condiments to your table, they will if you ask for it. Indeed we know Thai restaurants in the Seattle area which offer fantastic Thai food, and a condiment caddy (such as this one, called "Puang Prik" in Thai) is usually brought out for the Thai guests and anyone else who requests it. Next time you eat at a Thai restaurant ask for this and spice your food individually. Each dish is shared, and eaten bit-by-bit as it's spooned over rice. In the picture above, the eaters are all in the same family. Serving spoons aren't placed on each food dish, but often a meal between friends will use serving spoons. Each eater reaches over and spoons out whatever he/she wants, sets it on their plate and eats it with rice. You might notice in the picture that the toddler sits on his aunt's lap. Children are often coddled in Thailand by parents and close relatives, the concept of high-chairs to seat kids is not a common one. In fact, Thai language has no word for a child's high-chair, and these are not sold in stores. Often kids will sit on someone's lap at the table, and spoon fed until they are quite old by American standards. Next time you eat Thai food, if you don't already observe the custom of sharing dishes, try it. Order several different dishes, each with it's own serving spoon, and place them in the middle of the table. Then place some rice on your table and spoon bit-by-bit onto your rice. At left is a picture of a Khan Tok, a tray used to hold the bowls containing various dishes that make up a khan tok dinner. Typically the khan tok has legs, as shown. The name is derived from kan, or bowl, and toke, a low table made of woven bamboo. Khan tok dinner started with humble beginnings in the north of Thailand where mothers would gather various small dishes on a small tray and serve it to the family, then take away the empty dishes on the same tray. 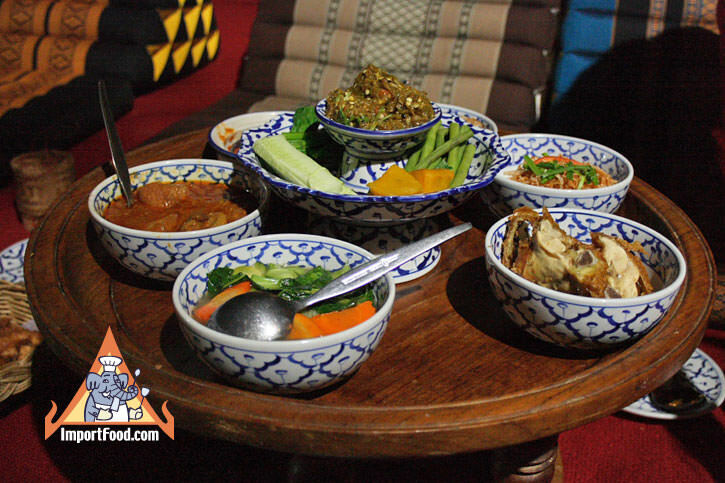 The prestige of a khan tok dinner has grown over the years, and now this style of meal is a major form of entertainment in Thailand's northern region. The khan tok are more elaborate, made of teak and sometimes lined with gold. Khan tok dinners are for honored guests or special occasions. 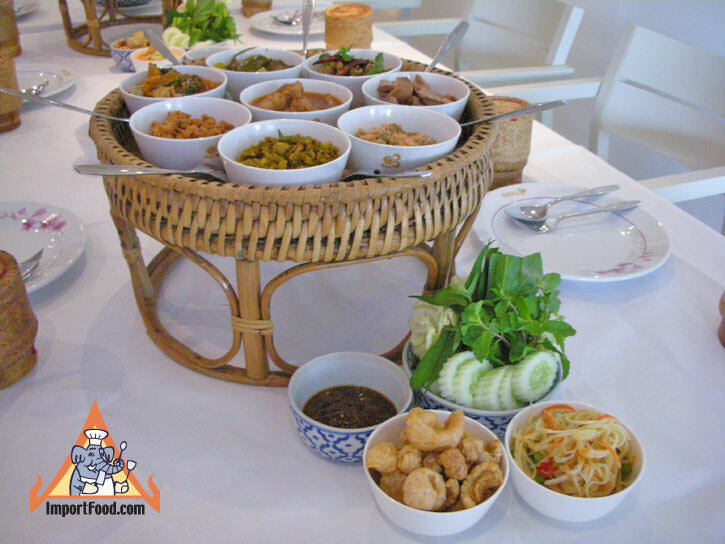 A variety of food is served, but khan tok always includes sticky rice is served in small serving baskets. Khan tok meals are celebrated throughout the north of Thailand especially at hotels where foreign visitors are treated to large celebrations. An interesting custom is for the khan tok meal to start with a massive quantity of sticky rice, in a basket the size of a bathtub, being brought out by several men who carry it out on bamboo sticks being led by traditional Thai dancers. This signals the beginning of the meal. Cigarettes rolled with banana leaf are served with the meal, the dancers perform on a candle lit stage, and large balloons made of silk paper, heated with a candle in the middle, float above. We hope you enjoy this report of the customary Thai meal, and the regional khan tok dinner. Please feel free to leave comments about this story which we will add to the page below. Also see: Thai Ordination Ceremony and Thai Wedding Customs, and our visit to a local Thai restaurant.